Community Chickens Guide to All Things Easter! By Community Chickens on March 21, 2013 Visit Community's Website. So, here at Community Chickens…we’re pretty keen on eggs. Being chickens keepers and all…, well for us, eggs are pretty eggciting! So each year when Easter rolls around, it’s a wonderful excuse to have tons of fun with all that our chickens provide! Here is your one stop guide for lots of “egg themed” decorating ideas! Some come from the creative minds of our very own contributors, and some that we found on some fantastic crafting blogs and Facebook pages! The art of coloring eggs in the spring dates back to pagan times and has remained a tradition carried through the ages. The symbolic meaning of the egg, representing new birth, life and regeneration is a common theme in many religious ceremonies and cultures throughout history. But before we start the coloring process, we must first prepare the egg for color. Hard boiled is the traditional way to cook an egg meant for dye. But anyone who’s ever tried to hard boil a egg fresh from the coop knows that they can be difficult to peel. Luckily, the columnists at Community Chickens have come up with several solutions to this problem. 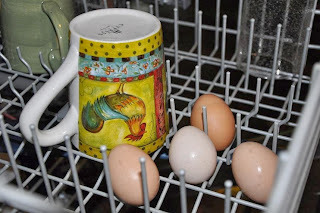 Jennifer Burke of 1840 Farm writes about her experience with legendary Julia Child’s method for hard cooked eggs in her post My Quest for the Perfect Hard Boiled Egg In the experiment she discovers a great technique for peeling perfection! And finally, Rebecca Nickols of The Garden-Roof Coop gives us 5 different methods for making a hard cooked egg in her post There’s More Than One Way to Boil and Egg. Her variations include on the stove, in a crockpot, the microwave, the oven and even in the dishwasher! Through the creativity of the modern crafting world, egg decorating has become a true art form and the humble egg shell, an inspiring blank canvas for all sorts of beautiful designs, textures and whimsy. The most important element in making an ordinary egg into an Easter egg is color! If you’re like us here at Iron Oak Farm, with Araucana mixed breeds, French Black Copper Marans and an assortment of other brown egg layers, your egg basket is probably a beautiful mix of color already. But at Easter, sometimes you just want Purple! To bring vibrant color to your brown eggs try Jennifer Burke of 1840 Farm’s technique in her post A Very Colorful Celebration. 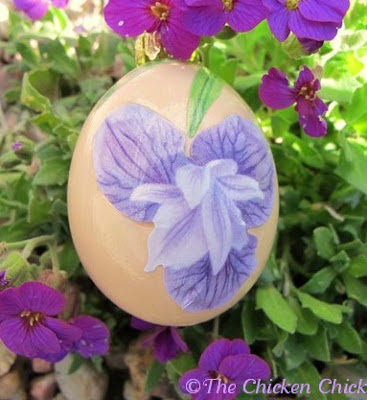 She gives step by step directions for saturating the brown egg shell with deep jewel tone color! An absolutely stunning and simple way to display your coop’s bounty. If you are the more natural type looking to dye your eggs without artificial coloring, there are many fruits, vegetables, herbs and flowers that lend color to eggshells. If you want to create eggs with many different colors then perhaps you would like to try Pysanka. Pysanka was developed in the Ukraine and is a highly detailed way of decorating an egg using wax and dyes. This form of art dates back to ancient times, with each element of decoration having a symbolic meaning relating to earth and the sun. In my post Ukrainian Eggs I describe my first experience with this art form, and how to create intricate designs using the traditional wax relief method of Pysanka. Another idea is using rubber bands to dye eggs in a striped design. Similar to the wax method, the tightness of the rubber band creates a relief effect preventing the dye from coloring the area where the band is stretched. For instructions on this technique visit Rubber Band Dyed Eggs. Sometimes nature is the best place to look for inspirational beauty, like in Rebecca Nickol’s post DIY Botanical Easter Eggs where she uses leaves, ferns and other elements of nature to leave beautiful botanical designs on egg shells. If you wish to give your eggs a bit of two dimensional flair then perhaps carving is the way to go. In my post Turn Eggs Into Lace, I describe the history of the more popular Emu or Ostrich egg carving tradition, and how a simplified version can be applied to chicken or duck eggs. 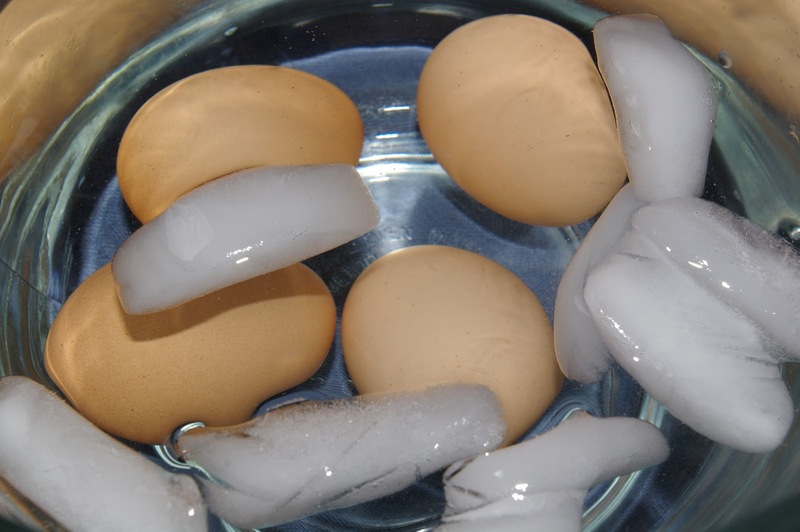 Once you start drilling holes in eggs, the next natural step is to think of fun things to fill the shells with! This fun egg craft will please your creative side and the practical jokester in all of us! 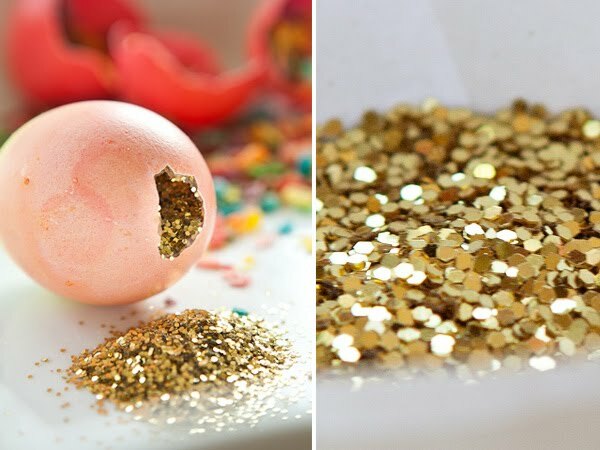 Drill a hole in an egg, blow out the egg white and yolk and fill the empty eggshell with fun glitter or confetti! The eggs can be thrown in a glittery game of fun or “cracked” over the head of an unsuspecting person showered in confetti. For more detailed instructions visit the Oh Happy Day Blog! You don’t need real eggs to make an egg themed treat! These adorable lacey eggs can hold Easter candies or small toys. They are made with cotton yarn and a balloon! Visit Little Birdie Invitations and Design for the complete instruction! And finally we couldn’t end this Easter themed tour without desert. How about a sweet spin on traditional Deviled Eggs? This original recipe comes from Butter Yum, where the idea of a Jello Jiggler is used to create the egg shape, a small hole is scooped out and filled with a delicious cream cheese filling. A lighter version of this recipe might include a fruit juice based gelatin and a whipped cream filling sweetened with honey or maple syrup. Honey Whipped Cream . 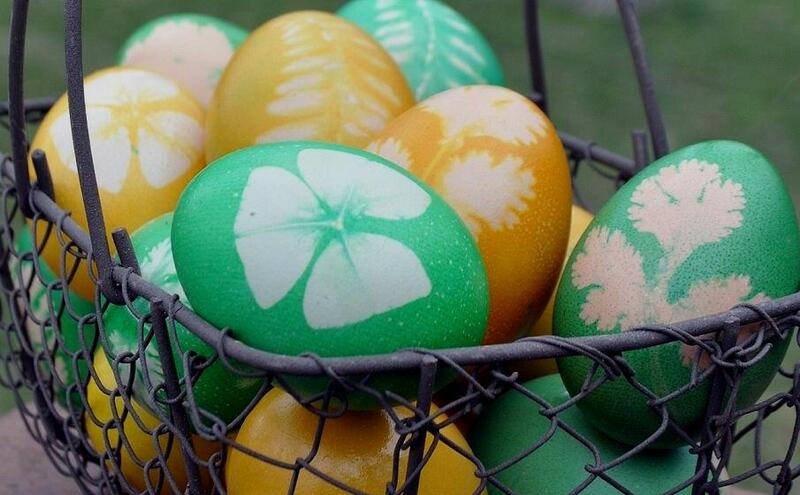 What plans do you have for decorating your eggs this Easter season? We’d love to hear about them! Share with the community by leaving a comment below or visiting the Community Chicken’s Facebook Page. tried to access the colorful egg blog but got nothing but a picture; sure would like instructions on dying brown eggs…………. Jennifer Sartell says,,>> The art of coloring eggs in the spring dates back to pagan times and has remained a tradition carried through the ages. The symbolic meaning of the egg, representing new birth, life and regeneration is a common theme in many religious ceremonies and cultures throughout history. That being said, what’s the difference now? Do you know what the word, pagan means? It is CONTRARY to what GOD means. Having an egg REPRESENT the Resurrection of Jesus Christ is not only pagan, it is down outright wrong. Don’t forget your bunnie that LAID that egg, ok? Very smart representation these pagan times are.